Over the next few days I will present 3 creations that use many of the same elements but have a different feel and target audience. We often worry about buying “too much stuff” (although that concept is TOTALLY foreign to the likes of me! 😉 ) and where to store it all. 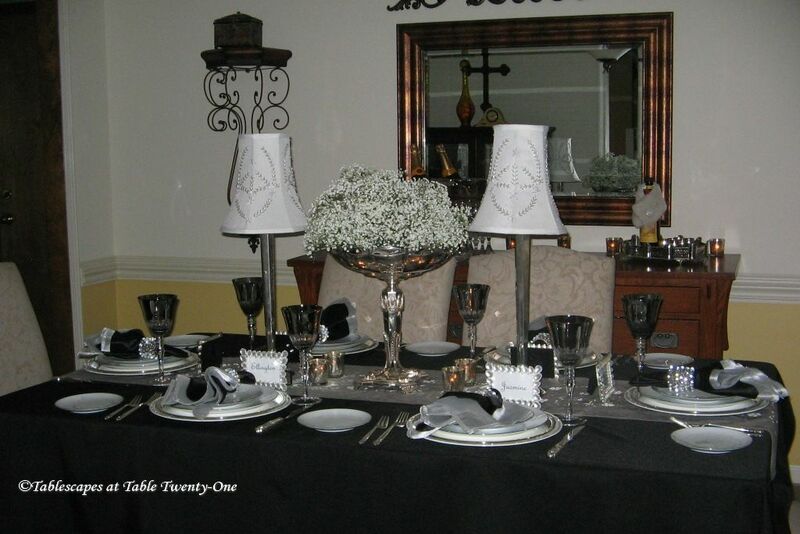 These next 3 posts will demonstrate how you can easily milk multiple tablescapes out of a few key pieces. This is, after all, a teaching blog…and I hope you’re able to glean some good ideas from this ongoing demonstration. INSPIRATION: A big bunch of multi-colored shiny metal doo-hickeys purchased at Pier 1 six or seven years ago. The foundation of this table that was used as a teaching tool in my most recent “Art of Tablescaping” class is a bright red 90″ x 132″ tablecloth from LinenTablecloth.com. Nothing says Christmas like the color red, and I love this as an anchor color for the overall look. Oh, how I love to use gold at Christmastime! The use of a gold acrylic charger (Old Time Pottery), gold-tone flatware, and beautiful American Atelier “Florentine Gold Scroll” china knocks a little wind out of brightly-colored whimsy’s sails. 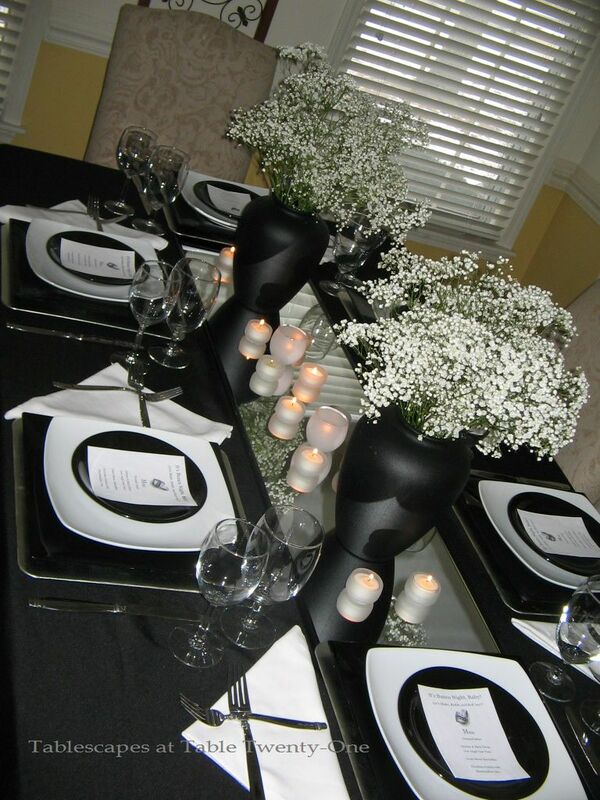 It dresses the table up a bit, gives it a little refinement while still letting the use of color take center stage. The napkin treatment is simply a 20″ x 20″ purple napkin from LinenTablecloth.com dressed with a contrasting red satin ribbon. See how the color invades the gold’s space but they still play nicely together? Someone once asked me, “Why all the stemware on the table?” Well, I’ll give you the two-fold short answer on that one: I like to serve water (palate cleanser), some sort of tea or lemonade, and often a nice wine or champagne (because cocktail hour is never quite long enough) AND they just look so darn good!!! 🙂 The more sparkle, the better as captured here with deep gemstone colors juxtaposed against milky white with shiny gold detailing. The colored stems are from Pier 1 (9-10 years ago) and my Mom gave me the gorgeous white goblets that she had since the 1970s. I bought these neat gold metal Christmas tree place card holders a number of years ago at a wholesale clearance sale. See how the multi-colored sparklies look like lights? I knew one day these would fit right in with a table’s decor! I have about 40 of these sparkly, jingly, wobbly metal sprigs of pure joy. For an upscale look, I simply bunched them together in the pitcher that matches the goblets. This is a good example of how using things en masse can add style. (Think how baby’s breath looks all limp and sad when there are only a couple of stems, but how it comes alive when used in a burst of snowy, showy goodness! Click HERE, HERE, or HERE to see examples on this site of what I mean.) To bring the same show of color down closer to the table surface, I filled bowls with multi-colored Christmas balls. Simple, inexpensive. To bring a little more shimmer to the table, gold mercury glass votive holders from The Village Gardens in Blue Springs, MO. I always like to dress the buffet in decor that works with the table. I cannot for the life of me remember where I bought these contemporary gold metal trees, but I love ’em! Again, see how the sparkly adornments resemble lights on the tree. I chose these not only because of the color, but also because of the modern form. They are the perfect counterpart to the inspiration pieces!!! The American Atelier “Florentine Scroll” coffee service is set up on a lacquered gold tray from Pier 1. The votive holders on the buffet boast beautiful, rich colors with a mercury glass lining and are from World Market 2 years ago. These photos don’t do adequate justice. The light reflected from these is spectacular! I’ll be back in a few days with the 2nd in this series! Don’t forget to visit Cuisine Kathleen’s weekly blog party “Let’s Dish!” and Susan’s “Tablescape Thursday” to get ideas from lots of other very talented bloggers from all around the globe! You know I love using the same things again and again, tweaking them a bit here and there to make them seem new. Your colors are so very bright and happy, just as I hope the season is for you. It’s so good to see you pop up again. You know you had me with all this color! I love it all, and those white goblets are really gorgeous. I love color! This is a fun table- I could see this for a New Years Eve party! The stemware is beautiful! Yes we must reuse things and be creative on how to make them look new and interesting which you are very good at doing! The big bright red tablecloth really makes a statement! Hope you’re feeling much better too! Cool table, Alycia! I love the stemware, especially the white. Your centerpiece is fantastic. Festive! And the red door fits right in. 🙂 You and your Mom both have exquisite taste. Merry and Bright is a great holiday look. Multi-colored lights always speak to my inner child, even though they haven’t been “in” for so long. Gorgeous mercury glass votive holders. Looking forward to more posts. Ok, what time do we eat. I’m there! Love the table and I also saw a gorgeous tall tree in your dining room you lucky girl! The colors you used are always so festive and bring such joy to your table, they make me think of loud echoes of laughter and great memories…. Sparkly, jingly, wobbly, thingamajigs work for me everytime! I hear ya on the storage tip. It’s always a challenge for me to shop from my stash but I’m learning. I also, enjoy what I’m learning from you. Looking forward to more. Sheer deliciousness, Alycia!! Such happy, vibrant colors…can’t help but smile when you see them all together. I’m so glad you’re feeling well enough to play with your dishes! Hi, your tablescapes are beautiful? I love the crystal candelabra you had on the previous page. Where did you find them? OMG!! Color, color and more color with lots of bling is “my” thing! 🙂 Love it. I’ll have to do this next time since I already started my holiday table. I had my husband sit down with me and look at your tablescapes. Now he understands why I’m so hyped up, because setting the table was, shall we say, too close to the kitchen. I’m not a cook. But now that I have time (retired), I’m all in. Thank you Alycia! Hi Alycia–So nice to hear from you over at my blog, and oh my gosh, I love your tablescape today! Those gorgeous votive candle holders on your buffet-wow! I think this would be so festive for New Year’s Eve, too–the centerpiece looks like wonderful, bright fireworks going off. What a beautiful table, I am loving all the color. The glasses are so pretty and different. The place card holders are so pretty too!!! Such a fun, merry and bright table. Love your ability to reuse items and make it all seem new. Glad to see a post from you. I have missed you. Hope you are much much better. Love this post – you were meant to be a teacher and I am always happy to be your student! Those modern trees are woderful and the centerpiece on the table is so festive!! Beautiful, as always!! Wow, Alycia, you really DID buck the system — and very well, too! Your vibrantly-colored tablescape reminds me of the colors on my Grandma’s Christmas tree when I was a little girl; those big multi-colored light bulbs! I’m looking forward to seeing how you use and re-use elements of this table on future tables. I am way behind on visits, Alycia!! Thanks so much for stopping by. I bought the napkin rings at Target a couple of years ago. They caught my eye right away. Had no idea how I would use them, I just knew they were going home with me. I love this table you’ve done. Looks like you are back! Hi Alycia, Love your multi-colored shiny metal doo-hickeys as a centerpiece 🙂 More stems the merrier on the table, I say and I love the purple, green and white goblets on the table! Love seeing your monogrammed wreath on door reflected in the mirror! I bet your students have a blast with your classes. Such a wonderful and different take on the Christmas Season. So full of joy! I am way behind on visiting. Such a busy time. Happy to see you back in the swing. So pretty! Those name holders are terrific! Very rich looking with all those. Colorful stems with their gold touches!